Josh Moreman scored for Deeping Rangers against Harborough Town. 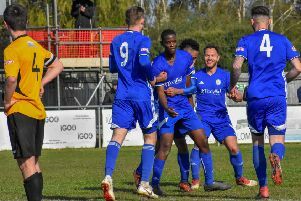 The champions-elect are now nine points clear of second-placed Deeping Rangers with just three matches to go and they have a vastly superior goal difference. Star, who had won their previous two matches, competed well and only fell behind midway through the second-half after failing to deal with a long forward ball. Jake Sansby was denied an equaliser by a superb save and Daventry sealed the points deep into injury time. Deeping consolidated second spot with a thrilling 3-2 home win over Harborough Town. David Burton-Jones put Deeping in front, but Harborough had taken a 2-1 lead by the break. Josh Moreman, on-loan from Peterborough Sports for the day, claimed a classy equaliser before an unfortunate own goal from the visiting ‘keeper in the 90th minute gave Deeping the win. Deeping goalkeeper Luke Elsom’s huge punt forward was turned into his own net by his opposite number. 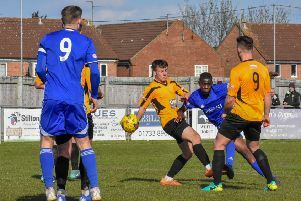 Deeping are four points clear of third-placved Rugby Town who won 2-0 at fading Holbeach United and Pinchbeck United are clear in fourth after overcoming a half-time deficit to win 3-1 at Leicester Nirvana. Ollie Maltby, Charlie West and Alex Beck scored for the Knights. Fifth-placed Blackstones were held to a 1-1 draw at lowly Raunds in Division One and needed a Jake Pell equaliser to share the spoils. Bourne won 3-0 at Burton Park Wanderers, while a Chris Down goal gave next-to-bottom Huntingdon a 1-0 win over top six side Lutterworth Athletic. Toby Allen’s hat-trick and two goals from Jack Friend helped March Town to a 6-3 win over AFC Sudbury Reserves in Division One North of the Thurlow Nunn Eastern Counties League. March are fifth, but with a game in hand to go fourth. Premier Division: Daventry Town 2, Peterborough Northern Star 0; Deeping Rangers 3 (Moreman, Burton-Jones, og), Harborough Town 2; Holbeach United 0, Rugby Town 2; Leicester Nirvana 1, Pinchbeck United 3 (Beck, West, Maltby). Division One: Burton Park Wanderers 0, Bourne Town 3 (Randall, Driscoll, Elger); Huntingdon Town 1 (Down), Lutterworth Athletic 0; Raunds Town 1, Blackstones 1 (Pell). Division One North: March Town United 6 (Allen 3, Friend 2, Jackson), AFC Sudbury Res 3; Needham Market Res 6, Wisbech St Mary 3.